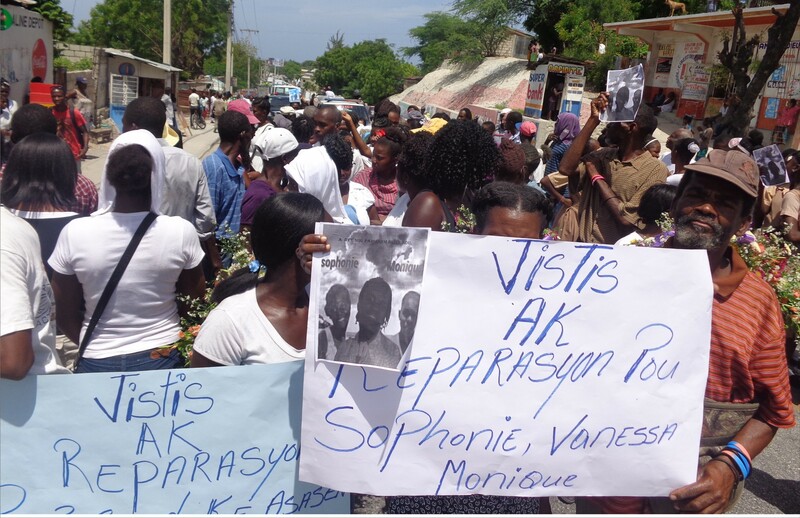 To the Haitian Government: Please accompany the Bureau des Avocats Internationaux, and all of the organizations that are fighting for cholera victims to get justice and reparations. If the Haitian government cannot stand with the victims of cholera to get reparations, we will consider our elected officials as irresponsible leaders. Each of us here has a family member who was a victim. The United Nations said they came to help us, but it is the poison of cholera that they disseminated into the water, to kill the our children. With all the other actions they have committed that we know of, we cannot support this. We cannot tolerate this. We cannot accept this. Everyone who was a victim of cholera should get justice. Because we have the right as a people, to get justice when [they violate our rights.] Like all other nationalities, we are people. We have blood running in our veins. The government can’t stand down. We have to force the government to stand up with the Bureau des Avocats Internationaux and all the other organizations that are defending the victims of cholera, for the country to get justice and reparations, and to compensate all the victims that they [the United Nations] harmed.